A compact but very practical solution for the travelling lacemaker. As it is suitable for use with full size bobbins, there is no requirement to invest in smaller travel bobbins. It's cambered sides help to hold the bobbins in place while working. Two moveable blocks are fitted into the flat work area, each being approx 4 inches (approx 10cm) square and just under 2 inches (5cm) deep. The approximate overall size is 14½ inches across x 12 inches x 2 inches (approx 36 x 30 x 5cm) and its weight is approximately 500gr. It is also available with a 3½ diameter roller which enables the pillow to be used with either roller+one block or with two blocks (see lower image). 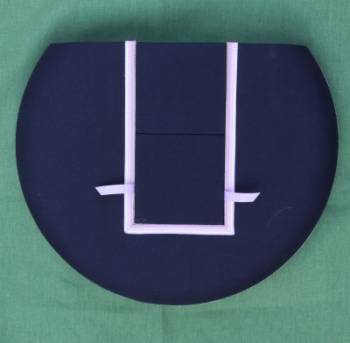 It has a hard foam interior, a hardboard base and is covered in blue cotton fabric, ready for use. The trim may differ in detail and colour from the example shown.